In what it says is a first for a chlorinated polyvinyl chloride (CPVC) producer to establish operations in India, US-based speciality chemicals firm Lubrizol has broken ground for a new TempRite CPVC compounding plant in Dahej. Construction of this plant is an integral component of the company's previously announced US$400 million global expansion of its resin and compounding manufacturing capacity. 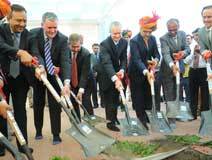 The US$50 million plant will have the capacity to produce 55,000 tonnes/year of compounds. The plant will be strategically located in the Gujarat Industrial Development Corporation (GIDC), which is one of the largest chemical parks in the country. Many of the raw materials required for Lubrizol's speciality chemical product portfolio are produced in GIDC. The plant is said to be well-positioned geographically to serve the growing Indian market as well as support the emerging growth of the TempRite CPVC business in South Asia, the Middle East and East Africa. "Our investment in India is a major step forward for our customers based in the region," explains Manoj Dhar, head of TempRite Engineered Polymers in South Asia. "With the projected growth of our FlowGuard hot and cold plumbing system products, this plant will be instrumental in enabling us to better meet the growing demands in the market." 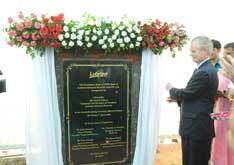 A groundbreaking ceremony at the Dahej site on April 4 was attended by Eric Schnur, President of Lubrizol Advanced Materials; John Nunnari, Global General Manager of TempRite Engineered Polymers; Timothy Madden, Managing Director of Lubrizol Advanced Materials, South Asia; and various other members of the Lubrizol India management team.